Contra Vision creates blooming marvellous window displays ! For retailers and marketeers looking to create visual impact with high end window displays a recent Contra Vision project exemplifies what can be done. 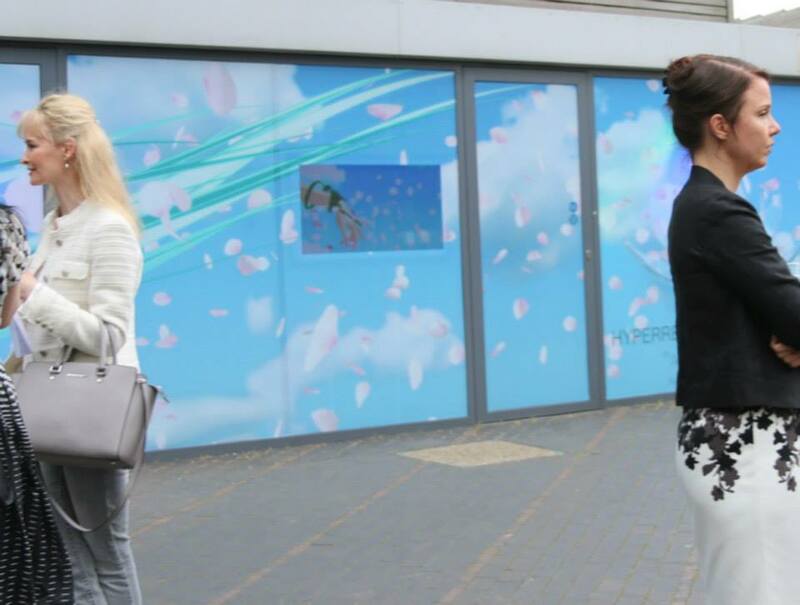 Contra Vision® BACKLITE™ perforated window film makes a bold statement combining see-through graphics with an animated film to promote a designer perfume developed by artist Adham Faramawy. The window dominates Bermondsey Square, in the heart of London’s contemporary art hub and will last until June 27th. Artist Adham Faramawy has developed a multi-media piece combining graphics, animation and an olfactory sculpture. Adham commented ‘ I could not be more thrilled with the Contra Vision material’. The ease of application may belie the work gone into creating this project. This installation provides a perfect example of how retailers and point of sale specialists can create innovative window displays to highlight products or campaigns. At Contra Vision we work collaboratively with artists, designers and clients to ensure the right products are chosen to deliver such eye-catching installations. Author Contra VisionPosted on May 27, 2015 July 26, 2018 Categories Great Applications, UncategorisedTags Contra Vision BACKLITE, Digital ProjectionLeave a comment on Contra Vision creates blooming marvellous window displays ! Contra Vision Lights up the Tyne! This year the Bupa Great North Run will see its one millionth finisher cross the line, a world first for an event of this kind. To celebrate this milestone, on Thursday 4th September the Newcastle Gateshead Quayside and the River Tyne was transformed into a giant outdoor arena for the Great North Run Million Opening Ceremony, marking the official countdown to the 1millionth finish of the race on Sunday 7th September.The spectacular opening ceremony featured live performances from Dire Straits legend and local hero Mark Knopfler, Sting, the Unthanks and Chase and Status. The event was a multi-media spectacular, with fireworks, animations, giant sculptures and video mapping onto the iconic Sage building as captured in this stunning image by photographer Ben Hines. 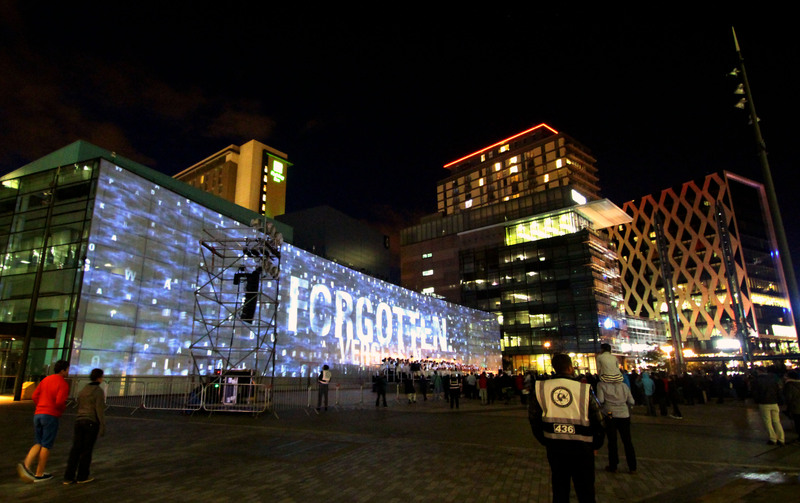 This is where Contra Vision® came in as The Sage has been wrapped in our material to allow for image projection on the night but also ensuring the building was usable during the run up to the event, by maintaining vision out. The installation was particularly challenging as the windows of The Sage are not rectangular and each one differs, planning was also essential due to extremely tight deadlines. The site was surveyed by AAA Signs Ltd of Gateshead who also project managed production and delivery of the pre-packed kits for each individual window. The material was specified by AAA Signs who chose to work with distributor William Smith because of their extensive capabilities and material support.This was an extremely creative application of our material linking the benefits of see-through graphic technology with a dynamic visual and musical event. The Newcastle Gateshead Quayside came to life with spectacular set pieces designed by Jon Bausor, a specially commissioned film and animation by BAFTA award-winning artist Tal Rosner, music composed by Ivor Novello-winning Dan Jones and performed by Northern Sinfonia, and performances by hundreds of volunteer performers choreographed by Nathan Curry; all combining to tell the spectacular story of the North East. Contra Vision is proud to have played a part in this. Tickets for the concert and event sold out weeks ago, however you can catch it on YouTube and also on BBC 2 on the evening of Sunday 7th Sept on the Bupa Great North Run highlights coverage. 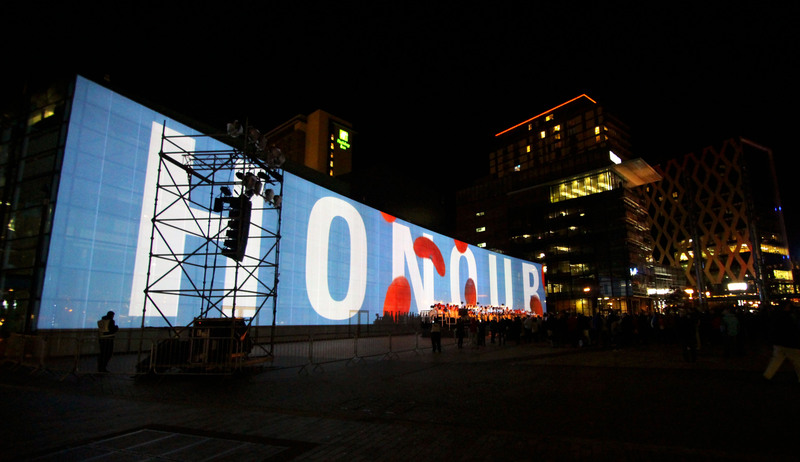 We will also post film of the digital projections shortly. Below is an interior view of through vision maintained when the material was installed. Author Contra VisionPosted on September 5, 2014 September 9, 2014 Categories UncategorisedTags Building Wrap, Digital ProjectionLeave a comment on Contra Vision Lights up the Tyne!